Just what exactly is going on with John Cena? We're not entirely sure, but he's been positively off his t*ts lately - and we sort of love it. Hot off the heels of thumbing his nose at the entire wrestling business by pulling out his bant-tastic 'Sixth Move of Doom' at WWE's Super Show-Down, Cena, now looking like a Stars in their Eyes version of JBL, has appeared in another WWE video chronicling his recent trip to Yinchuan, China. And his whole demeanour is just a little... off. 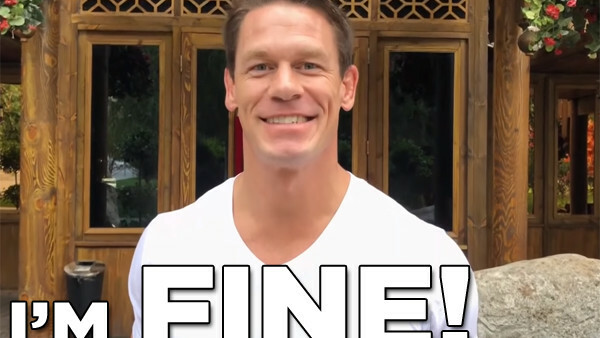 Wearing a simple white t-shirt and bearing an expression not uncommon in student digs late on a Friday night, Cena says his experiences in Yinchuan reflect his normal life, before stressing he's "in a fun place." There's the vaguest glint of despair in his eye as he gurns to the camera. Cena's other adventures in Yinchuan have produced James Milner-esque moments of ironic mundanity - and they've been absolute gold. We saw him repeat an Abbott and Costello routine outside a café in possible tribute to Jim Neidhart, and then skate around an empty rink in a mall with placid, Python-like understatement. Everything's absolutely fine in Camp Cena, even if he's acting like a man in the throes of denial following a very sticky public breakup. Except we know that whole charade is probably just that. It's more likely, then, that Cena is just taking the proverbial because he now can. Long may it continue.